The Continuum will be at WonderCon in San Francisco this weekend. Look for bonus coverage from the convention floor all weekend. Activision on Monday released details and images from X-Men: The Official Movie Game (working title), which will be released in May. Co-written by Zak Penn, the screenwriter of movies X2: X-Men United and X-Men: The Last Stand, and comic book writer Chris Claremont, X-Men: The Official Movie Game immerses players in an original storyline that provides the back-story for X-Men: The Last Stand. 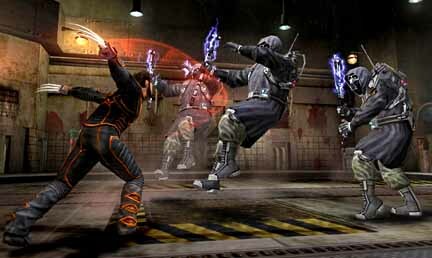 For the first time, the game enables players to truly command the powers of characters from the X-Men movie universe by allowing players to assume the roles of Wolverine, Nightcrawler, and Iceman as they wield and upgrade their signature powers and maneuver through unique environments designed to showcase their abilities. Click on the thumbnails for larger and fuller images from the game and for a rundown of the game's features and more images, CLICK HERE. Veteran actor James Cromwell has joined the cast of Spider-Man 3, Sony Pictures has confimred for The Continuum. Cromwell will play Capt. George Stacy, the father of Gwen Stacy. Cromwell, 66, has more than 120 film and television roles to his credit. He was nominated for an Academy Award in 1996 for his role as farmer Arthur Hoggett in Babe. Cromwell's recent credits include The Longest Yard, I, Robot, The West Wing and Six Feet Under. In the comics, George Stacy was killed in Amazing Spider-Man #90, saving a child from debris from a fight between Spider-Man and Doctor Octopus. In other Spider-Man 3 news, The Continuum has confirmed that Neil Spisak is returning as production designer. Aspen Comics has released its solicitations for May. Playmates Toys had announced plans for its new toy line based on Teenage Mutant Ninja Turtles Fast Forward, the television series from 4Kids Entertainment that will air on Fox and on Cartoon Network. The new series takes the Turtles 99 years into the future. Brought there by Cody Jones, the grandson of Casey Jones and April O�Neil, Leonardo, Michelangelo, Donatello and Raphael are forced to adapt to a whole new world � without their home, junk food or Shredder. Twenty-six standalone episodes will begin airing in September, with Playmates' toy line launching in July. Playmates is also developing a toy line for the Turtles' CGI animated feature film. For a rundown of the toys based on Fast Forward, CLICK HERE. * Sci Fi has scheduled a repeat broadcast of the Painkiller Jane movie for for Tuesday, March 7 at 9 p.m. The network will also rebroadcast the Man-Thing film on Sunday Feb. 26 at 9 p.m. and on Tuesday, March 21 at 9 p.m.
* Superman Returns will have its premiere at Grauman's Chinese Theater in Hollywood on June 22. * Ian Nottingham is returning in Witchblade #98. * Lucy Lawless is joining the cast of SciFi's Battlestar Galactica for 10 episodes of the third season. Lawless is reprising her role as D'Anna Biers. * Coming Tuesday: The Batman news -- and much more!!! * Wednesday, Feb. 1: Spider-Man 3's Gwen Stacy, Marvel and DC First Looks and SLG's Tron. * Tuesday, Jan. 31: Blade, IDW Publishing for May, Claypool Comics for May, The Batman, DC trade paperbacks for June, Rex Mundi and The Simpsons. * Monday, Jan. 30: Spider-Man's new costume, Infinite Crisis, Smallville, Image's Death Dealer and First Looks. * Sunday, Jan. 29: Krypto, Smallville and Dark Horse First Looks. * Saturday, Jan. 28: Smallville, Teen Titans, Star Wars: Rebellion and First Looks. * Friday, Jan. 27: Smallville, Image Comics First Looks, Devil's Due First Looks and Sam Kieth's My Inner Bimbo. * Thursday, Jan. 26: Black Panther/Storm wedding, DC Comics' 52, V for Vendetta, New Universe preview and Marvel and DC First Looks. * Wednesday, Jan. 25: X-Men: The Last Stand, Smallville, Justice League Unlimited, Spider-Man and Marvel and DC First Looks. * Tuesday, Jan. 24: Superman: Brainiac Attacks, WB/UPN merger, Marvel movies, Cannon Hawke, Necromancer, Devil's Due for April and Alias Comics for April. * Monday, Jan. 23: Diamond Select, Ms. Marvel, Marvel's Western event, Ultraviolet images and Image First Looks. * Sunday, Jan. 22: Aquaman on TV, First Looks and Bongo Comics for April. * Saturday, Jan. 21: X-Men: The Last Stand, HBO/Cinemax for March, Narwain's Albert and First Looks. * Friday, Jan. 20: Superman Returns, 2005 sales, Sensational Spider-Man, Joss Whedon talks Astonishing X-Men, Marvel First Looks and Devil's Due First Looks. * Thursday, Jan. 19: Jim Valentino on ShadowHawk, Spider-Man 3, Archie Comics for April, Aspen Comics for April, IDW First Looks, Marvel First Looks and Image First Looks. * Wednesday, Jan. 18: X-Men, Marvel Knights, Marvel and DC First Looks and Oni Press for April. * Tuesday, Jan. 17: Marvel Comics for April, Golden Globes, Dan Jurgens exclusive to DC, Family Guy at Devil's Due, Alias and Image First Looks.